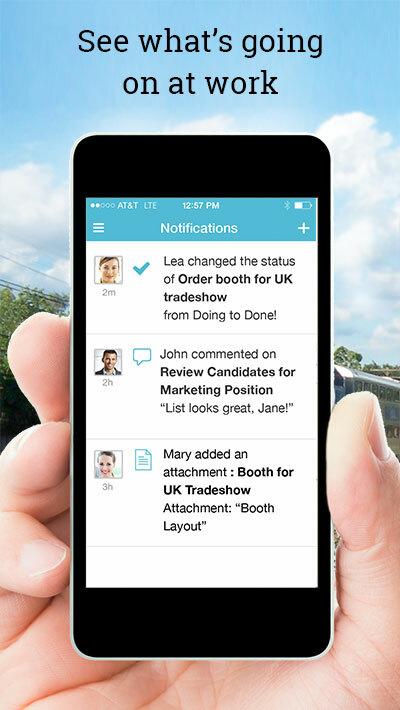 Redwood City, CA, September 4, 2014 — Workboard Inc., a provider of management, teamwork and leadership solutions, has released the latest version of its free iPhone app. The mobile app is built for Workboard users to easily communicate by sharing and prioritizing goals, collaborate on action items and track work through completion. Workboard is a free web-based application used by teams in hundreds of companies to share priorities, action items and feedback, and to automate weekly status reports and scorecards. Front office teams in sales, marketing, business development and client services benefit from greater transparency, velocity and accountability; the mobile app will make it even easier to coordinate shared execution on these fast paced, revenue-driven teams. Back office teams in legal, finance and IT find it replaces status reports, spreadsheet lists and scorecards they spend time to recreate weekly. New interface: Like the web application, the Workboard iPhone app interface has been completely revamped for ease of use for business users. Filter and sort by workstream, priority, status, RAG rating and due date. Quickly zoom in on your action items or the ones you’ve delegated. Ping: With a simple swipe, Workboard will send a status ping to an action item owner -- no typing required to get an update from your team members. Notifications: Get instant, actionable alerts when others comment on your work, assign an action to you, complete items you’ve delegated, or add attachments. Moveable trays and elements: Organize your mobile dashboard quickly and easily so you can track work on the go. “Workboard makes it much easier to come together as a team and execute well for clients. Because I often travel to client sites, I rely on the mobile app to make sure the team is in sync and we're delivering our best,” says Mike Martin, Practice Director at BTRG. Workboard and the companion iPhone app are free to teams of any size. For more information, visit www.workboard.com or download the iPhone app on the iTunes App Store. Workboard's free productivity app for mobile users.